Paint Tool SAI, PSP 7. Group / Alliance Affiliation(s): No permanent alliances. Works for the highest bidder. Places Lived: All over the world. Current Residence: Currently living slightly west of Happy Harbor, Rhode Island. Hair Type: mainly thick and straight, but tying it up over the years has left it with a wave. Reaches the tops of her shoulders. Cherry's body is synthetically enhanced to give her slightly more efficient metabolism, healing, immunity, and overall resilience. She therefore rarely gets sick from the minor ailments that everybody else does, and pretty much never develops scars. She plans to further augment herself in the future. 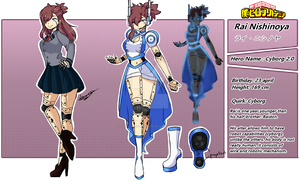 Cherry likes wearing high tech equipment while on missions, and regularly has her rocket boots and bracers over top a cybernetic body suit. The green clips on her head are also neurological implants to enhance mental processing and allows her to connect to computer systems. General Personality: Cherry can be described as a selfish, hedonistic, smartass. She likes getting what she wants, and she believes she deserves it. Cherry has no real loyalties beyond taking care of herself and her possessions, and therefore has little patience for authority over her. She enjoys winning and is extremely competitive when it comes to fields she feels is her expertise (weapons, tech, espionage). She's blunt, vulgar, and mean-spirited because she thinks it's funny. She's probably a sociopath. Hopes: Just finding the next rival, the next thrill, and living in decadence and over-indulgence. - Don't say I didn't warn ya.. Closest Friends: none really, but Kayne may qualify? Kayne's at least like a possession of hers, anyway. Girlfriend(s)/Boyfriend(s): she doesn't tie herself down in relationships, but quite enjoys seeking out one-night-stands with the pretty ladies. She will be a tease to men to get what she wants, but she's pretty lesbian otherwise. 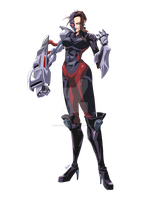 Power(s): Her abilities come from her cybernetic enhancements and equipment. Technology Expert: Miss Candy is experienced with using all sorts of technology and can figure out technology she's unfamiliar with fairly quickly (she is pretty advanced in her understanding of user interfaces, ergonomics, and engineering). PROS: Fast and competent with most technology, whether advanced or not. She has been known to use guns, power suits, bombs, computer viruses, and even mechas. CONS: none, besides that she thinks "non-tech" like magic is bogus business. Dual Wielding Ion Blasters: Miss Candy has two Ion Blasters slung across her back. They are kind of like laser guns that explodes the targeted area on beam impact. PROS: even though she's not ambidextrous, she can dual wield with the best of them! Allows for long-distance fighting and can be used to blast open things. CONS: her guns need to be recharged after use (after 50 shots fired each). She can recharge them with special nuclear cartridges, but they're expensive--plus dumping the nuclear waste is bad for the environment! The guns also tend to overheat if she uses it repetitively, so she usually has to wait a second between shots (that's why she has TWO guns!). Rocketeering: Her boots and bracers have similar technology to her Ion Blasters, except that they are modified for propulsion. PROS: use her boots OR bracers to fly! She can also use them to repel enemies by blasting them in the face with it. Acts as armour when they run out of juice. CONS: Like her guns, her boots and bracers will need to be recharged after being used (around 20 minutes each). Synthetically Enhanced Body: Miss Candy's body has been altered to provide her with more efficient metabolism, healing, immunity, and overall resilience. She has also altered it to allow her to network with her neural implants and cybernetic suit better. PROS: rare for her to get sick or get scars. Heals from injuries much faster than normal, and body doesn't tire as quickly during battle. Neural implants and cybernetic suit allows faster processing and ability to interface with most technology and software intuitively. CONS: difficult to get treatment if she DOES get sick, injured, or her body "malfunctions" because it's all custom-built for herself only. Style: strategic with little wasted effort since she wants to conserve her power supplies. Strengths: She's pretty strategic in placing her shots or throwing her punches and kicks either to get the enemy away from her or to move them into the right position for a finishing blow. She will use the environment to her advantage if possible. Weaknesses: She can't fight too prolonged of a battle due to limited power reserves. She doesn't take very much punishment before retreating due to how complicated healing herself can be. Most of Cherry's past is a mystery, as even her real name probably isn't Cherry, but she has mentioned that she came from a very well-off family. Cherry was always a bright child but did not do well in school due to her disdain for following authority. Perhaps she was raised too self-entitled and spoiled. Either way, she was disruptive in class and often used her status or intelligence to manipulate or take advantage of her peers. She was finally pulled out of school in grade five to be homeschooled. Homeschooling also didn't work out for her, so the focus went into self-study with whatever the heck Cherry would accept. Cherry wasted a couple of years doing stupid stuff and being bored out of her mind (going shopping, surfing online, watching tv, etc.) until she found herself absorbed in tech and computer hacking forums. She caught on pretty fast and her parents were glad their darling genius daughter finally found her calling! They supported her interests however they could by buying her gadgets and bringing her to testing facilities to scope out all the cool stuff. At 14, she was placed on internships with manufacturing and testing facilities. She got bored of not working on her own terms and quit that noise at 16. At some point, Cherry commissioned a bunch of equipment to be made for her on her parents' dime. She then stole much of her parents' wealth for herself by draining their accounts. It's unclear if she actually bankrupted her own family, but maybe! She ran off with all the goods and her parents decided not to track her down (you know, at this point, it sounds like Cherry had pretty bad parents lol). Cherry became a mercenary for hire as "Miss Candy" and enjoyed her days and nights with the stimulation and challenge she so lacked before. She found a young girl named Kayne and noticed Kayne's affinity for technology. Seeing in Kayne a younger version of herself, Miss Candy plucked her from her environment to teach her the ways of the genius Cherry Candi! Miss Candy's now at large living a pretty exciting life with her accomplice, Miss Kayne. She's just selfish and does what she wants with little care about consequences to anyone else. Her main motivations are pleasure, power, and the freedom to do whatever and whoever she wants. This requires cash, of course! So she steals it or works for the highest bidder. Oooh.. you have a double personality? How do you manage the both of them? xD Do you end up at odds/arguing with yourself over things at times, then? as she is a bounty hunter has she met Lobo. Does things like E.M.P. wave work on her. and can it be hacked? EMPs would probably short circuit her rockets and guns (so she could probably fall out of the sky lol), but her plug suit and body should be designed to be insulated against most of it (though I imagine a powerful enough pulse could feel like getting electrocuted for a second). Well at least someone should keep and EMP with them at all times now XD. Her suit sounds like tony stark and his core. And whoever loses has to pay up? Hahah..
Who would have the money for that! LOL Plus, we'd probably end up destroying our own electronics and surrounding electronics half the time trying to aim at her. Yeah! Except her whole body and nervous system is rigged up! And I am guessing Stark is just the core in his chest (maybe it got more advanced though, I haven't read up much on Iron Man). She would like to have a full suit of armour like Stark one day though. Probably will in the future! but would she have a chance against him? Candy: I don't care about Stark and his lousy lawyers! Let them try and catch me! I rip what I want! so true, hes pretty much impossible to beat, in the comics he is banned from heaven or hell. Or.. Deadpool? lol.. Deadpool's not allowed to die..
Miss C: Sounds like a PARTY! Let's roll, Kayne! And you've got some great catchphrases and quotes for her. #1. Which voice actress would you like to play her. #2.Does she have a theme song? my guess is, "I Want Candy!" by Bow Wow Wow. If you like, I would like to give some suggestions. If you're open to them. I haven't though about voice actors though! But definitely someone a little bratty. I see you haven't thought about a voice actress to play Miss Candy. I have some options for voice actresses you can choose to play the character. Let me know which voice actress you decided on or maybe you have thought of one of your own. ooh, any links for examples of their voices? It works well in conjuction with her accomplist Kayne! xD Candy and Kayne... sweethearts of crime! ..."The freedom to do whatever and whoever she wants..."
Was designing a techie mastermind villain, but got distracted. Mind if I send you a note about it? Miss Candy sounds like they could be 'best' friends (that is, untill one of them backstabs the other of course). Hahaha, yes sure! Note away! The backstabbery is going to be awesome. if she even THINKS about stealing my ninja turtles comic book collection, I will DEFINITELY FART IN HER FACE! She doesn't care about your comic books! good, then none of my diarrhea splatter will smear her face.